Currently our total stands at $49,364 from 331 donors. Thanks to everyone who has donated so far and for everything else you and they are doing to end the reckless practice of water fluoridation. The TSCA lawsuit* against the EPA has sparked three creative ways to increase money for the legal fund. Will donate $1500 when we reach 500 donors! 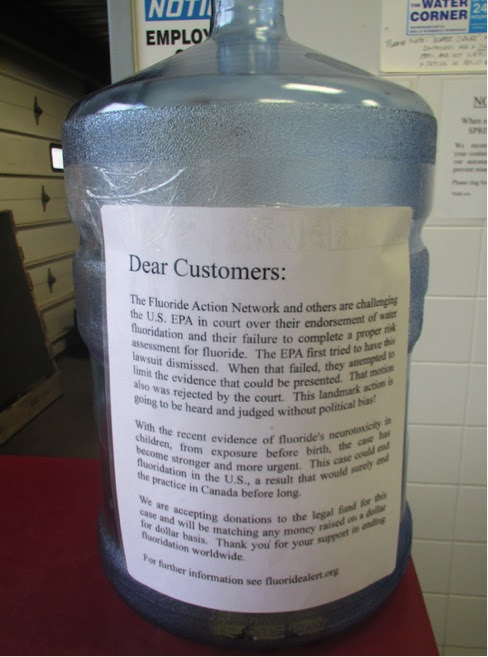 The third is also a challenge from yet another long-time (since the 1970s) fluoridation fighter, who firmly believes that this lawsuit is our best chance ever of ending fluoridation worldwide. Will donate $5,000 if we can get another 100 (from the current 331) supporters to donate $10 or more online. And will donate ANOTHER (!) $5000 if we can get another 100 people who donate $5 or more by check.We all agree that we need more numbers of people on our team to win this lawsuit. Our goal is to raise $75,000 by May 31. If we make that deadline then we have another generous benefactor and a non-profit organization that have each pledged to donate $75,000 to yield a healthy legal fighting fund of $225,000. Ideally, we would like the burden to be shared by a 1000 people. *The Toxic Substances Control Act (TSCA) authorizes the U.S. Environmental Protection Agency (EPA) to prohibit the “particular use” of a chemical that presents an unreasonable risk to the general public or susceptible subpopulations. TSCA gives EPA the authority to prohibit drinking water additives.